As far as afghans go .... this one is fun. It's fun to look at and I have no doubt that it is equally (perhaps even more so), fun crochet. It measures 46 x 60 inches and is made up of 176 daisy medallions that are 4 1/2 inches from point to point. 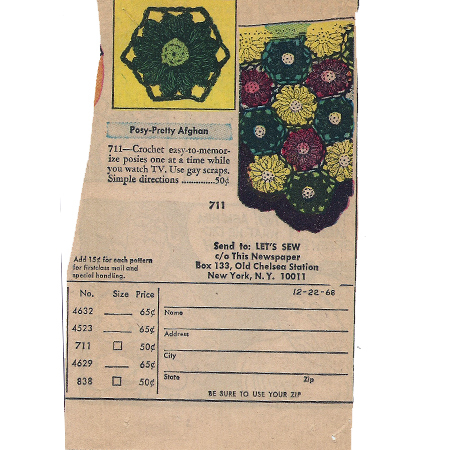 It's one of the mail order patterns, Design 711. The fun part has to be making these sweet daisies. Make them on the couch or in the car. You could even go overboard and take them out to dinner and work them between courses. You know how addictive they would become. In no time at all, you'd be making afghans for everyone ... even those you have already gifted with an afghan. Okay, so maybe that is a stretch ... but, that is what I would be doing. Just 50 cents, plus first class postage, back in December of 1968. I bet they sold plenty of them.